As a trumpet player, composer and educator, Anthony Stanco is a rising talent in today’s music scene. Anthony’s brilliant trumpet style is exciting and demonstrates his understanding of the jazz tradition. Anthony is equally passionate as an educator and composer. 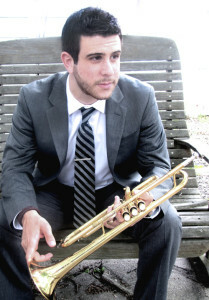 Anthony Stanco started playing trumpet in the fifth grade in the Fraser Public School System. His musical education was elevated when he joined the Detroit Symphony Civic Orchestra and Civic Jazz Orchestra under the direction of Marcus Belgrave and Rodney Whitaker. When Anthony was in high school, he established himself as a professional musician in the Detroit area. He performed as a leader at the 2006 Birmingham Jazz Festival with his quintet, as well as the 2007 Detroit Jazz Festival. Anthony was also selected as the top high school soloist during the 2007 Detroit Jazz Festival for his performance with the Fraser Jazz Ensemble. After graduating from high school in 2007, Anthony was accepted at the prestigious Manhattan School of Music to pursue his bachelors in jazz performance and also studied privately with trumpet technician Laurie Frink. In 2014, he finished his graduate degree at Michigan State University where he had the chance to learn from jazz greats including Rodney Whitaker, Reginald Thomas, Michael Dease, and Etienne Charles. Anthony’s professional work has consisted of concerts, workshops, and studio sessions. In 2008 Anthony recorded a live album with Manhattan School of Music Afro-Cuban Jazz Orchestra under the direction of Bobby Sanabria called Kenya Revisited LIVE! This record was nominated for a Latin Grammy. He has also recorded with renowned trombone player Michael Dease and has been featured on his latest CD entitled “Relentless”. Anthony has performed with world class musicians such as Winard Harper, Michael Feinstein, Tye Tribbett, and Aretha Franklin to name a few. In June 2013 Anthony took the 1st place prize in the International Trumpet Guild, Jazz soloist division. Anthony is also an established composer and has recently premiered his five-movement suite entitled Look up Hannah: A Suite for the Protester. As an Educator, Anthony was privileged to start at a young age. He had his first private student when he was only twelve years old and continues to teach privately to students of all ages. At Manhattan School of Music, he was part of their outreach program, Music Arts-In-Education, and taught at various public schools in New York City. In 2011 he returned to the Civic Jazz Orchestra as a mentor and director of Civic Jazz Combo B. Anthony was also a graduate assistant in Jazz Studies at Michigan State University and also teaches at the MSU, Community Music School in Lansing, MI. He has also had the opportunity to teach at Ohio State University, Birch Creek Music Performance Center, Blue Lake Fine Arts Camp, and many other music programs. Currently, Anthony is proud to represent the government’s Bureau of Education and Cultural Affairs. Anthony Stanco and The Crucial Elements have done two international tours with American Music Abroad. On tour they partake in cultural exchange, masterclasses, and live concerts. Anthony has recently released his first record entitled The Crucial Elements. He produced the record himself and released it on his record label, AJS Records.